Last Friday night, Ole Gjerstad‘s and Joelie Sanguya‘s film Qimmit: A Clash of Two Truths premiered at the Cinéma Parallèle as part of the Présence autochtone aboriginal film festival. Co-produced by Piksuk Media Inc. and the National Film Board of Canada, the film won the Rigoberta Menchu Second Prize at the 20th First Peoples’ Festival Awards. Qimmit (“many dogs”) is the story of the seemingly mysterious disappearance of the dog teams in the Inuit communities of the Canadian north in the ’50s and ’60s, shortly after the Inuit were moved off the land and into communities. The film, sets out to tell the story of “one shock, two truths” as the Inuit and the ‘white’ authorities totally disagree on what happened. Shot during a Quebec inquiry (for Nunavik, the Quebec Arctic territory) and a “truth commission” for Nunavut (the rest of the Eastern Canadian Arctic) the film is full of emotionally wrenching testimony. For the Inuit, there is no doubt that the authorities, and specifically the police, exterminated the dogs in order to force the aboriginal people to become sedentary. The former constables interviewed for the film denounce these views as lies and fabrication. But the Inuit testimony is very convincing, and the filmmakers wisely see this whole story as an expression of a colonial power relationship. The film is very well made with some stylish and evocative but restrained re-enactments. I put a few questions to Ole Gjerstad, who also happens to be one of my best friends. What was the greatest difficulty making this film? To convey to an audience in 2010 the colonial reality of the Canadian Arctic forty to fifty years ago. White authority simply took it for granted that they knew what was best for Inuit; Inuit were too intimidated by white authority — as embodied by any white person in their communities — to protest or resist. Things have changed dramatically, but if we cannot get the minds of the audience back to those days it will be very difficult for them to understand how something like this could happen. “One shock, two truths…” but in the end the Inuit version is so much more believable, partly because it’s emotional first-person testimony. How to explain that the ex-RCMP have blocked this out? The RCMP produced an internal review, which was conducted much like a police investigation, looking for “proof” and pretty much excluding the context. Add to that the many controversies and scandals that have plagued the RCMP in recent years, and I believe that the top RCMP brass decided the Inuit claims weren’t of much consequence. As for the Sûreté du Quebec, which was responsible for the killing of thousands of dogs after they assumed control of Nunavik in 1961, they simply ignored our requests, as did the Quebec government, saying they didn’t want to discuss the matter until they heard from the Inuit about settling the claims. I wondered when you say the dogs are back in the lives of the Inuit helping to reconnect with their traditions – it is of course a great thing to say at the end of a film, but is it a reality in many communities? 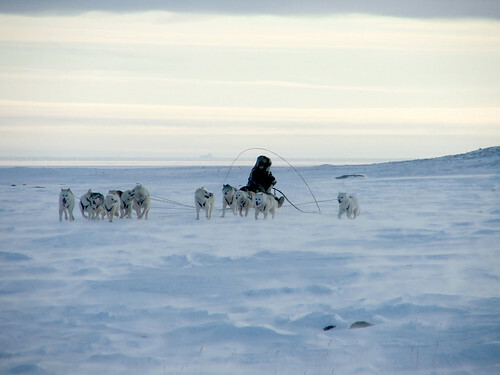 There are dog teams now in nearly all the communities in Nunavut and Nunavik. They’re used by Inuit outfitters for tourism, for trophy hunting by foreigners, by others for teaching traditional skills to young Inuit, and simply for pleasure. Nobody depends on the dogs to survive, but their return to the communities have established a visible link to a tradition that was at the heart of Inuit life not so long ago. Last month we filmed a ten-day traditional sled dog race, the Nunavut Quest, for a television series. The enthusiasm and level of interest in all the communities involved leaves me in no doubt that the dogs are like a weapon in Inuit hands to fight against cultural obliteration.